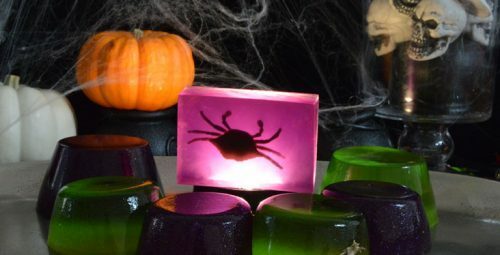 Spooky Halloween Soap is a great way to get people into the spooky spirit. 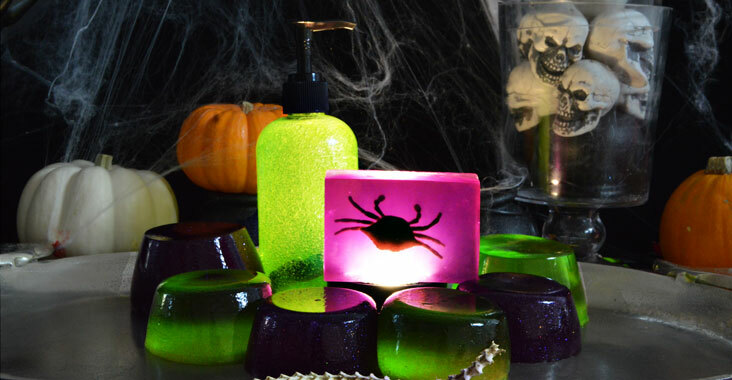 Whether for a Halloween party or just spooky decor, themed soap is always a good seasonal item to stock. This soap is a treat for the senses, it jiggles, wiggles, and smells lovely when you add Fragrance or Essential Oil. It uses our easy to heat and mix Jelly Soap Base. Simply melt the Soap Base in a double boiler, then just add your Fragrance and Color. Once it is mixed, you will need to pour it into your containers while it is still hot. The perfect ratio for a slimy green color is 2:1 parts Green to Neon Yellow Soap Colorant. 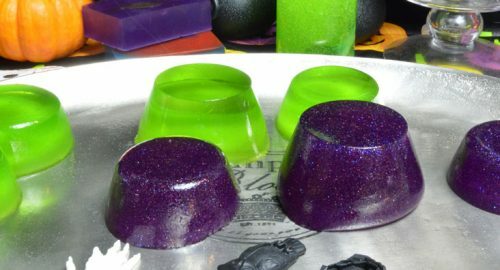 Slippery, slimy Jelly Soap makes a great kids party favor. Creepy crawlies and fun Halloween toys are everywhere this time of year. These fun and scary little toys can be put inside Liquid Soap Bottles or embedded into our Melt & Pour Soaps. Kids have a great time in the bath revealing the critters inside! You can find them wholesale for huge batches or in retail stores, dollar stores are a great spot to find them. Here we used eels from this Ocean animals Set we found on Amazon. We chose this set so the critters can be used for Halloween and summer soaps. 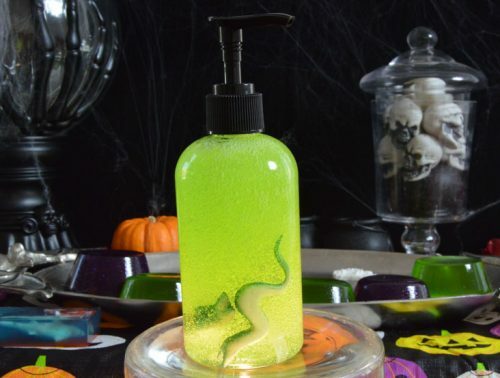 Two of our Bases that work great for a Spooky Hand Soap. The first option, best for suspending things like plastic eyeballs or critters, would be our Suspension Shower Gel. It is an easy to mix base that is meant to keep things like glitter and light objects afloat. The second option is to use our Multi-Functioning Liquid Glycerin base. The final product will be transparent, however, all of the toys you add will sink to the bottom. Before you add the Halloween knick-knacks, you will need to wash, dry, and spritz them down with rubbing alcohol. You want them to be squeaky clean before you add them to the bottles. Bug and insect toys hidden inside a bar soap is a big hit with the little ones. This adorable and fun soap gives them the incentive to wash their sticky hands. It’s a great goodie to pass out or Halloween party favor. Spray the critters down with alcohol before adding them to the soap. Make sure the toys you choose are made out of a harder plastic. They cannot be made out of soft plastic or that stretchy material. Simply spray down your bugaboo with alcohol. Then place them face down in the mold before pouring in your colored and scented soap.